Cutting paper and packages can present a challenge to people who have limited mobility. Many people lack the strength in their hands and wrists to manipulate a typical pair of scissors. The simple act of opening and shutting the scissors can also compound joint disorders and cause pain to the user. For this reason, scissors for disabled people have been designed to help make the process of using scissors easier for people who need assistance. If you or a loved one is having difficulty using regular scissors, then the following information will help you to learn more about the potential advantages of using scissors designed for people with disabilities. Scissors for disabled people have been used for a variety of purposes. Young children who have delays in their fine motor development will find it useful to use scissors with a spring that help them with opening and closing the scissors. Additionally, people with arthritis, poor grip and other joint problems will find that specially designed scissors can help relieve them from pain. This can make it possible for a person to enjoy their favorite activities such as sewing and crafting. 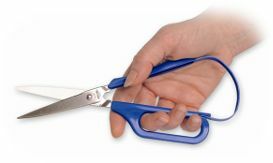 Modified scissors can also make it possible for a person who has lost a limb to be able to cut using a special pair of scissors that can be mounted to a table. Modified scissors can be found anywhere that school and office supplies are sold. They are a recommended handicap device that is popular by people who are purchasing supplies to enhance the accessibility of homes and schools for people with disabilities. Generally these scissors are inexpensive and are close to the same price as regular scissors. 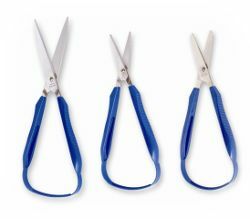 Loop scissors can be found in a price range of two to ten dollars. However, table top scissors can cost around twenty dollars depending upon the style that is purchased. Loop Scissors – The loop handle makes cutting more comfortable and effortless. Table Top Scissors – These scissors are great for someone who is one-handed. Place the object to be cut on the scissor blade and press the handle down. Scissors With A Spring Handle – The spring coil eliminates the need to open their palms as they cut. The blade reopens after every squeeze. 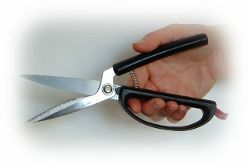 Good Grip Scissors – The handle is curved to fit your hand and is great for someone with decreased hand strength. Scissors for disabled people require the same type of care as traditional scissors. For example, they may need to be cleaned after being used on messy or sticky substances such as tape. Many people also find that keeping them stored in a safe area is a necessity when working with small children. Special cases can also help to keep the scissors blades sharp and free from debris and scratches. Occasionally, a person may prefer to have their scissors’ blades sharpened and oiled so that they will be easier to open and close. When planning for accessibility in homes, schools or offices, a person will want to include modified scissors in their plans. By using springs and table-top mountings, scissors can be made to be used by people with a variety of disabilities. These scissors can be found in prices and styles similar to traditional scissors, yet offer an opportunity for independence and the development of creativity for people who have disabilities.